Remove the corned beef from the package and rinse under cold water. Pat dry and season both sides with 1 teaspoon of garlic powder, 1 teaspoon of onion powder, 1 teaspoon of parsley flakes, 1 teaspoon of paprika and 1 teaspoon of black pepper. Place corned beef in deep baking dish and add 2 cups water. Cover with foil and cook in the oven for 2 to 3 hours. Corned Beef will be done when a knife can cut through. Set aside to cool. Remove the outer leaves of a medium head of cabbage and cut out the center core. Put the head of cabbage in a large pot and fill it to the top with water. Boil until the leaves soften and can easily be removed. Using tongs, pull off the leaves and set them aside. Once the corned beef has cooled, place a few chunks in the food processor and pulse until it flakes. Sauté onions in olive oil until lightly browned. Add the onions to the cooked rice and mix. Add the corned beef and mix. Put a large spoonful of filling in a cabbage leaf. Fold the bottom edge over the mixture then fold the sides over and roll into a tidy package. Repeat the process with the remaining cabbage leaves. Place the cabbage rolls seam side down in a baking dish. Pour beef gravy over the cabbage rolls. Cover with foil and bake at 350 degrees F for one hour. 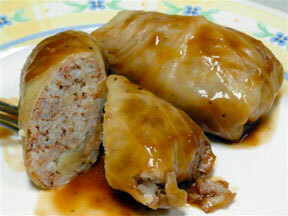 Cabbage rolls are done when a knife can be easily inserted.